Which teams paid the most money? Which players made the most money within each team? Which countries were the highest auctioned players from? Did Batsmen command more money in the 2014 IPL Auction than any other type of player? 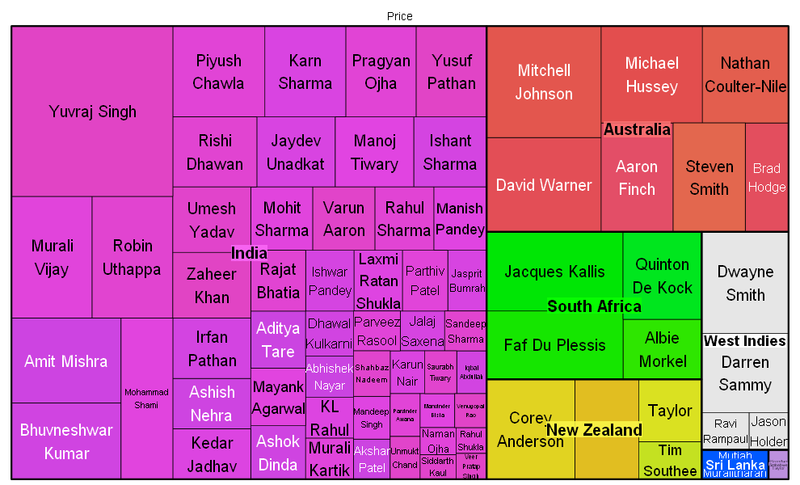 We deep dive into the 2014 IPL auction data and show you different perspectives from the points of view of teams, countries and types of players. The map below captures the money paid by the franchises for their player purchases in the 2014 Indian Premier League Auction. The rectangles are sized according to the auctioned price money, while the colours show the different teams. One can read the dominant IPL auctions in each team by seeing the map above. The retained players' individual prices (MS Dhoni, Gautam Gambhir, etc.) have not been disclosed yet and have not been shown. Mumbai Indians, Rajasthan Royals and Chennai Super Kings used the maximum limit for retention of players ahead of the IPL Auction, which saw also their total auction kitty of 60 crore being reduced to 21 crore. Chennai retained five of it's top players in captain Mahendra Singh Dhoni, Ravindra Jadeja, Ravichandran Ashwin, Dwayne Bravo and Suresh Raina. Mumbai also went on expected lines retaining their top performers from the 2013 IPL winning teams in captain Rohit Sharma, Kieron Pollard, Harbhajan Singh, Ambati Rayudu and Lasith Malinga. Rajasthan stuck with their youngsters and rewarded all the performers of the past season with retentions. Shane Watson, Stuart Binny, Ajinkya Rahane, James Faulkner and Sanju Samson were the five players who were retained by the Royals. Kolkata Knight Riders retained only Gautam Gambhir and Sunil Narine which set them back by 22 crores, whereas Kings XI Punjab made a surprise choice to retain uncapped Manan Vohra along with South African David Miller and their budget was reduced by 16.5 crore. Royal Challengers Bangalore retained their three big hitters - Virat Kohli, Chris Gayle, AB de Villiers which saw 29.5 crore being deducted from their auction kitty. Delhi Daredevils decided not to retain any player and had the full purse of 60 crore for the auction. One can look at the money spend for buying the top few players in each team using the map below. Rectangles are sized according to the auctioned price money, while colour shows the different countries. Data related to players who were auctioned during this IPL has only been used. For an overall perspective, the chart below tries to compare the total auction money spread across players from the different countries. As expected, the Indian players were in big demand with the IPL rules allowing only four foreign players to be fielded in the first eleven. The Indian player purchases totalled more than a whopping 115 crore!! Australia was a distant second with their player purchases totalling to 38 crore while South Africa was further behind with 21.15 crore. 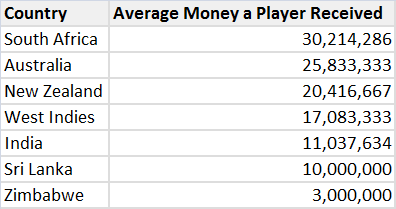 Interestingly, even though it appears that most of the money is spent towards the Indian players, India ranks only in the bottom three when it compares to the average money received by a player in a country as indicated in the table below. A global breakup of the top bowlers, batsmen, all-rounders and wicketkeepers who took their share from the auctioned kitty can be visualized from the map below. Rectangles are sized according to the auctioned price money, while colour distinguishes if the player is a batsman, bowler, all-rounder or wicket keeper. Data related to players who were auctioned during this IPL has only been used. 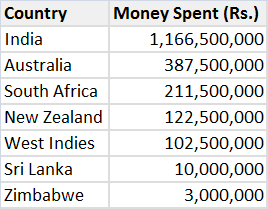 For a reader, who is interested in understanding the overall money spend across the batsmen, bowler and all-rounders, the following table provides him with that picture. Using these 2 tables, one can also understand that the average money received by a bowler (11868852) is less when compared to that of a batsman (19607143) and an all-rounder (17370370). For a complete detail of how much a team spend on each player, refer to the table below.